Last night, I ran over my friend Eliseo E-Motion's house to chill for a while. 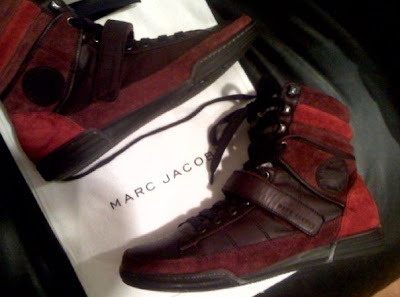 He had just come home with a pair of Marc Jacobs #M2331 sneakers from the Fall 2009 set in burgundy. So we sat down and opened the box together. Luckily i had my digital camera on me so i snapped some photos. The lights however, didn't cooperate with me fully, so some of the pictures have a lot of glare. 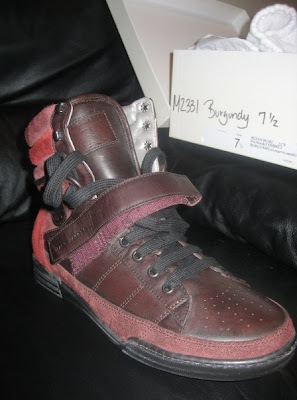 Anyway, personally I think these sneaks are pretty tuff. 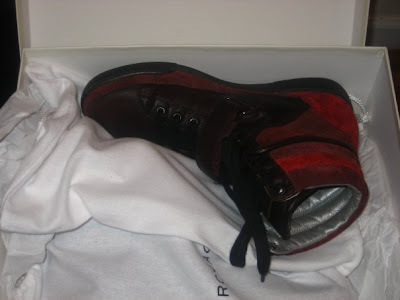 Below you can see the packaging and the sneaker which features a leather/suede upper with a strap to provide support in burgundy and red, with a black mid sole. Rumor has it that only one pair of each size of this sneak is floating around currently in the city. Which in short equals zero haters. 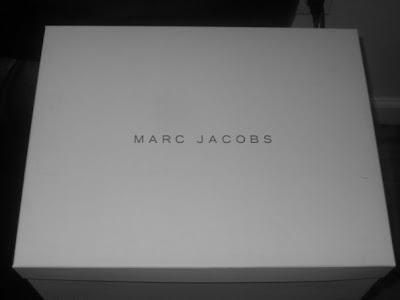 If you want a pair you can go to the Marc Jacobs store in the city. That is they still have a pair in your size! They will run you about $440 dollars though. Happy hunting!